Observation - Long-stalked Moss - UK and Ireland. Description: Found on surface of flower pot along with Funaria hygrometrica. Long thin leaflets, long red stalk, pendant capsule. The pink buds visible are Pleione orchids. Found on surface of flower pot along with Funaria hygrometrica. 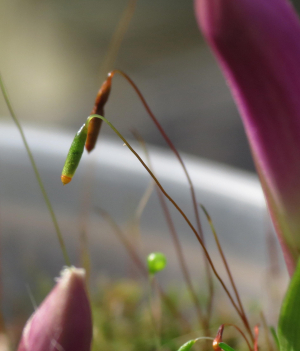 Long thin leaflets, long red stalk, pendant capsule. The pink buds visible are Pleione orchids.